This page contains a guide on Quick Cast in League of Legends (LoL), including basic explanations, mechanics, how to use them and other tips and tricks during gameplay. Quick Cast automatically casts the selected ability dependent on the current position of the cursor. This works for self-buff abilities, ground-targeted abilities and skillshots. It is also harder to accurately aim skillshots. However, it allows for faster skills as it reduced time delay between activating and aiming. 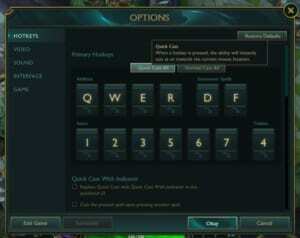 To activate it, press ESC and click on Quick Cast All, or you can click on each of the Hotkeys to separate which abilities to you want to Quick Cast. Summoners use it to lessen time delays while casting. This is most essential especially during team clashes and there’s not much time to aim. Most skills can be used with this mechanic without any hitch. However, there are some that is not meant to be Quick Casted like Poppy‘s Ultimate Skill or Zac‘s third skill. In the end, you should try to experiment and find out which skills work for you on Quick Cast or not.